Amazing views, all the amenities you can think of, on the best property located at Eagle Beach, the top rated beach in Aruba; huge top floor terrace with private Jacuzzi; living area with TV, BBQ.....Just unique and luxurious. Plenty of space decorated with good taste, you will not want to leave this Penthouse! Perfect for Families, Honeymoons, or Accommodations for Destination Weddings! Luxurious and private. Huge roof-top terrace for sunbathing and breathtaking sunset view. Lots of space. Just steps from the beach. 4 pools. Fully equipped kitchen. Close to everything, while still perfect for relaxation! This property is located on the best beach in Aruba (Eagle Beach). It is large and luxurious. Very comfortable. The roof-top terrace is great for sunbathing and for watching the sunset over the ocean. One of the nicest places in Aruba! This is a very well taken care of vacation home with a deluxe feel...much different than other vacation rental properties. The furniture is high quality and upscale (mostly West Elm and Pottery Barn). Guests have access to Eagle Beach, 4 pools, roof-top sun deck, fully equipped kitchen with all appliances. Lots of space for relaxing! The condo is located on a quieter part of Eagle Beach, but is very close to all of the excitement. Easy access to casinos and high rise hotels, a great grocery store just around the corner, and the most beautiful beach in Aruba! The complex is gated and there is 24 hour security on premises. A inexpensive public bus runs right in front of the resort. Taxis are easy to find on the main street right in front of the resort. If guests have a car, there is a designated parking space for the unit (everything is stress free...even the parking!). This property is stylish and modern...perfect for family vacations, honeymoons, corporate retreats, and mature adults. If you don't plan to be careful and take care of this property, please don't rent it! a)	If canceled or modified up to 60 days before date of arrival, 30% of the total price of the reservation will be charged in addition to costs associated with processing a refund. b)	If canceled or modified within 60 days before date of arrival, 70% of the total price of the reservation will be charged in addition to costs associated with processing a refund. c)	In case of a no-show, 100% of the total price of the reservation will be charged. Don't need all 4 bedrooms? This unit can be rented as a 1 bedroom, 2 bedroom, or 3 bedroom for special rates. Special rates also available for stays of 7 nights or more. Love this listing? Check out my other fabulous luxury penthouse listing #274330. Send an inquiry to find out what's available! Clean linens and towels provided at check-in. Housekeeping service is available throughout your stay for an additional fee. Full-size, laundry room in Penthouse. 2 safe reserved covered parking spaces in garage under building. Additional visitor parking is also available. 2 safe reserved covered parking spaces in garage under building. Gym/Fitness Center on site of the Resort Property. A fully equipped kitchen with all appliances and equipment necessary for cooking delicious meals during your stay. Basic Cable TV with 49 channels (American, Aruban, and Latin channels). Children's playroom located on site of the Resort Property. Tennis courts on site of the Resort Property. Sauna is located on site of the Resort Property. Resort property has 4 swimming pools. 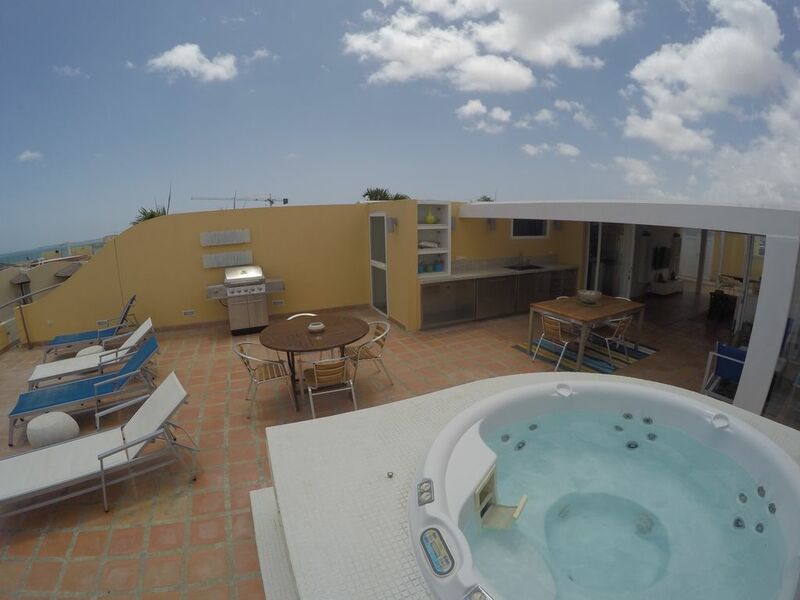 Private roof top hot tub can be used as a small pool by day and a heated jacuzzi under the stars by night.